Even though Spring has officially “arrived”, we are (of course) still in the middle of our rainy season here in Seattle, and so we’re still taking comfort in a delicious pan of roasted veggies now and then! 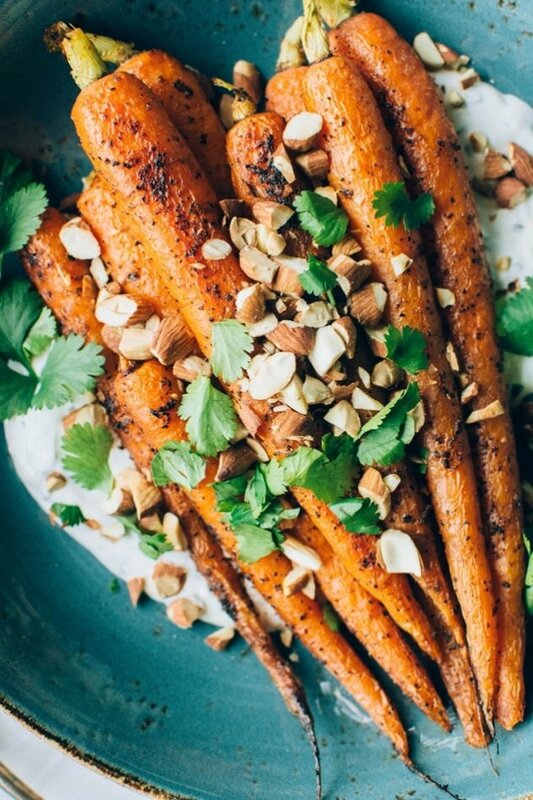 This week it’s black pepper roasted carrots with savory cilantro yogurt and toasted almonds. And really, as long as it’s not too hot to turn on the oven, I feel like roasted veggies always have a place in the kitchen, no matter what the season is. There’s just something so amazing about the caramlized sweetness and intensity of flavor that you get when you roast vegetables. It really adds a level of complexity and focus that keeps you coming back for another bite! 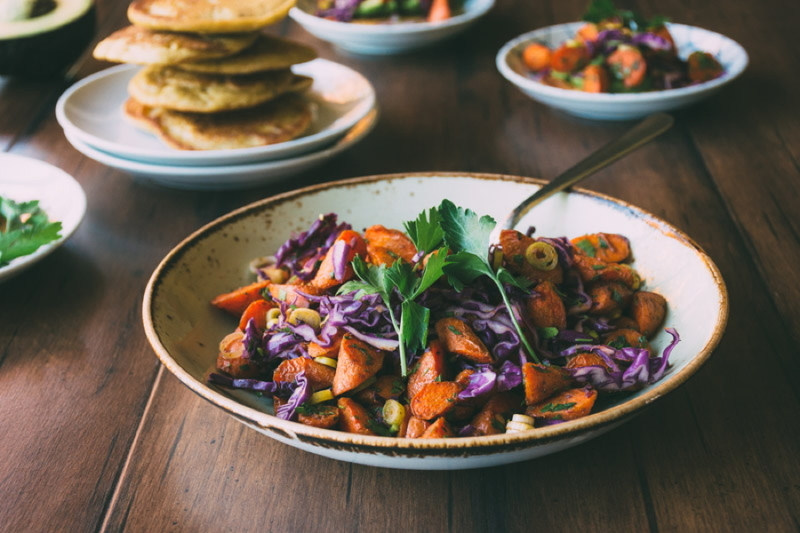 This entry was posted in side dishes and tagged carrots, cilantro, easy, easy dinner, eggs, gluten free, grain free, healthy, quick, roasted, vegetable, vegetarian on March 28, 2017 by Nyssa Tanner. daayum! here we are at the beginning of august (what?!) 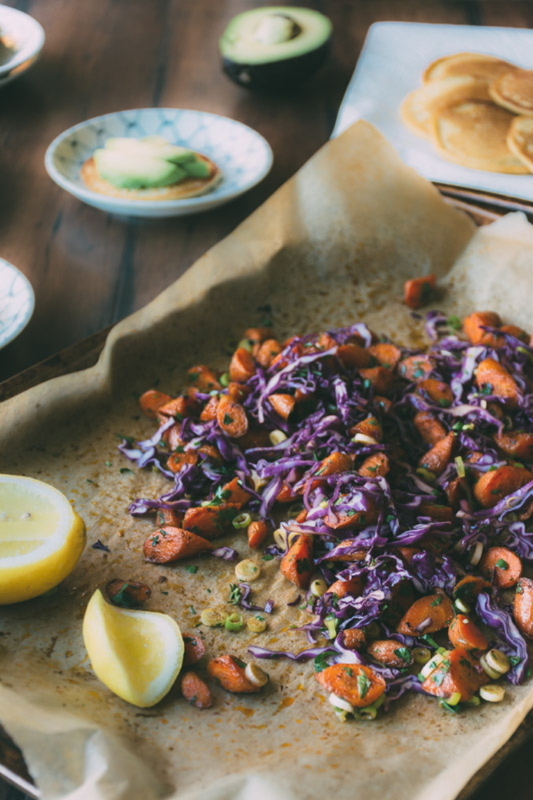 and this herby roasted carrot picnic salad with sprouted garbanzo bean pancakes and avocado fits right in like the sun in that big blue sky. I’ve been on the road on various little adventures lately and haven’t been able to spend too much time in the kitchen so this is a recipe I’m pulling out of my back pocket for y’all. I made it a while ago to bring to the beach for a sun and sand studded picnic lunch, and I figured there might be a moment to share it so before heading out the door I snapped a few pictures and wrote down the details. it was one of those totally perfect PNW summer days when the sky literally could not get any bluer, the trees shone emerald along the horizon and the breeze off the ocean kept the the heat at bay. I knew I wanted to make something to bring to lunch that was healthy and full of veggies but also easy to eat with our hands. I actually didn’t have much in the refrigerator (#sundayproblems) but a big handful of forgotten carrots, the end of a head of red cabbage (wins the longest-vegetable-life-in-the-fridge-award) and some herbs. I had also been waiting for the moment to try using the sprouted garbanzo bean flour that I had bought on a whim from thrive market* (*lazy girl grocery shopping obsession ). a quick google search brought me to this recipe and I was quickly on my way to beachy picnic food perfection. This entry was posted in lunch, salads and tagged easy, healthy, picnic, quick, roasted, salad, vegetarian on August 6, 2016 by Nyssa Tanner. I think it’s safe to say that we can officially give root vegetable season a big fat welcome hug! the last of those gorgeous heirloom tomatoes have actually disappeared from the shelves, and squash, root vegetables, and hardy greens have taken their place. I absolutely love measuring the seasons by what we bring to our dinner table – it feels like a way to really experience each season and all of it’s little flavor nuances. the change in what we eat is one of the most comforting things about ushering in the cold weather! 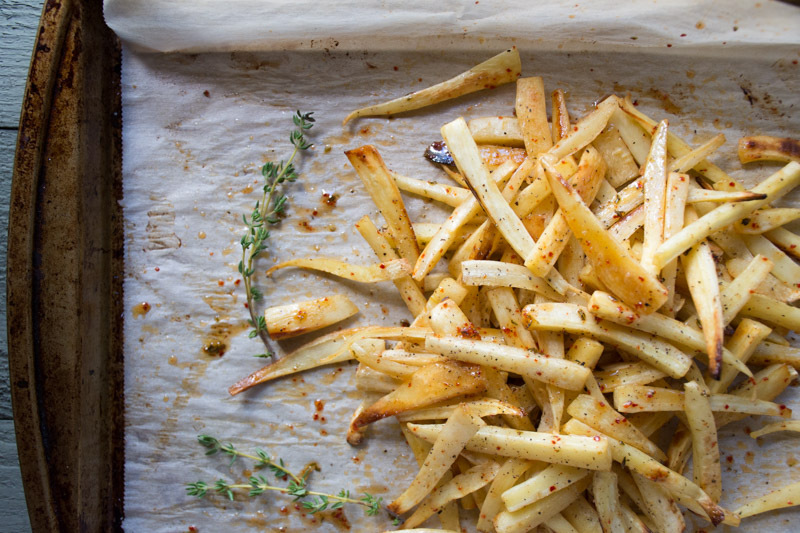 I’m super excited that this easy and tasty roasted parsnip recipe with a honey, chili & thyme glaze is going to be a new addition to our thanksgiving table this year. I’ve made it a bunch of times already and it always seems to disappear in a flash. pow! like magic. sweet, spicy, aromatic, and utterly delicious. and did I mention it’s really easy to make? I think it would make a great last minute option for the veggie side dish you need to bring to your thanksgiving dinner. 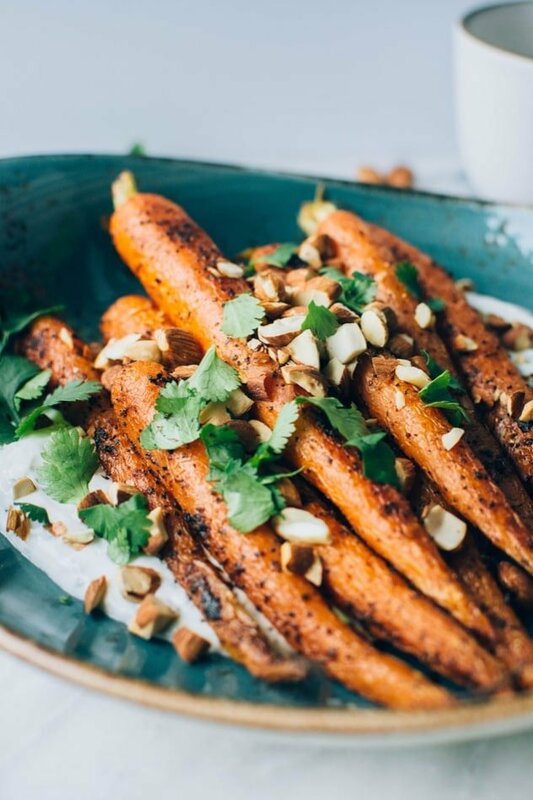 and while parsnips are the only veggie I’ve tried with this glaze I think it would also be super duper tasty yum with roasted carrots, beets or even brussel sprouts. because really who doesn’t want an excuse to roast all the veggies?! This entry was posted in side dishes and tagged easy, gluten free, healthy, quick, roasted, vegetable, vegetarian on November 22, 2015 by Nyssa Tanner.